Unfortunately whenever such corruption occurs, it mainly results in disorientation of your PST files. 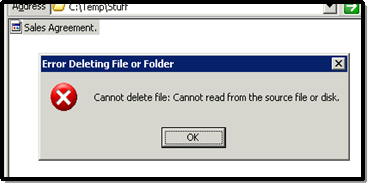 Once PST files are damaged, system displays a message “Cannot read from the source file or disk.” In PST file corruption, this is the most common type of error that occurs. However, it depends upon the severity of the issue that has damaged the file either partially or entirely. “Cannot read from the source file or disk” is often seen to occur mainly in 2003 and 2007 Outlook. Whenever this issue occurs it becomes very much clear that now user cannot access PST files as the issue has disengaged Outlook server with PST files. Thus, user should understand that PST files are corrupt and now it can no more be accessed. What makes PST File Corrupt? Certain reasons like heavy attachments, improper file extension, oversized PST files and compatibility issues may be sometimes results in the file corruption, but several other factors like virus infested files and presence of some malicious tools can also manifest such serious issues. The main role of the system administrator or user is to get rid of such issues. Scanpst tool: Since it is an Inbuilt-repair tool provided by Microsoft, users’ expect very much from it. Although this inbuilt tool tries to sort out the corruption issue up to some extent, but every PST file will be perfect after its treatment, cannot be guaranteed. Third-party assistance: To take assistance from third-party is highly recommended by top professionals. To make this thing done, you need a reliable and elegant third party tool like RecoveryFix for Outlook. This software has been designed to deal intelligently with such issues without affecting the content in corrupt PST files. Thus, any of the above mentioned solution can be tried by the user, but use of licensed version of RecoveryFix for Outlook is more recommended since it is perfect in retrieving entire PST files. For first time users, an evaluation tool has been made that works like licensed version of the tool, but does not allow to save it. However, the convinced user of the tool can definitely buy the license from RecoveryFix website.